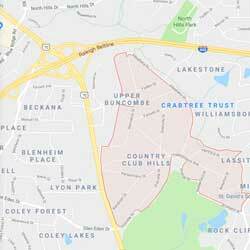 Country Club Hills is located in Raleigh, NC, west of Glenwood Ave and east of Crabtree Creek. It is an established subdivision with a regal upscale feel. The neighborhood started in the 1950s and consists of mature trees, oversized lots and stately homes. The home styles include Traditional, Georgian, Colonial, Williamsburg and Craftsman. Carolina Country Club is surrounded by the neighborhood which gives many of the homes a golf course view. Square Footage ranges from 3,000-5,000sq ft.
Short drive to Crabtree Valley Mall, which is the area’s largest enclosed mall with over 1 million square feet of shops and restaurants. Close proximity to North Hills “Midtown,” downtown Raleigh and the 440 beltline. Country Club Hills is centrally located to many “hot spots” around this area. Residents can join the 5 Star Carolina Country Club which offers amazing amenities such as golf, tennis, fitness center, a pool and clubhouse.